Finally some good news- Someone doing it right! Thanks for this uplifting update and explanation. Maybe ... Maybe if the photograph is not cheap Gatorade will not use it. You really believe that they sold a photo of the only perfect game this season... and of many seasons for that matter... for cheap??? 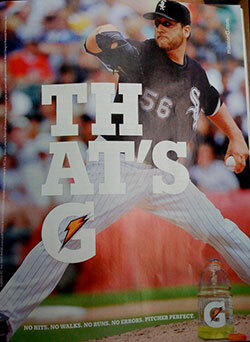 Gatorade, or any national advertiser, pays many thousands of dollars for media placement. Time was, not to terribly long ago, that they also paid handsomely for content, ie, photographs. Why should a multi national corporation go for a "cheap" photograph to market their product to the world? The comparison to the $30 Time photo is pretty apples-to-oranges though. The baseball shot is an image that is very rare - how many people were in that right place (I assume a press only area) with the right equipment, etc.? Now compare that to shooting a jar full of coins in a studio (even a temporary one would have sufficed for that shot) and it's easy to see why one sells for thousands of dollars and one for $30. Vesely had the negotiating advantage because he had a one of a kind image. The shot of the quarter jar could have (and was) been done by an amateur, and was priced accordingly. Not all photos are created equal, and I think the lesson here is to work hard at creating one of a kind images. This is a good thing that happned, but does it fit in with Getty's Preferred Customer (or whatever they call it) where the big clients pay a fixed sum each month and can then download all the images they can eat. Until I had myself taken out of that program (as a Getty photographer) and set a minimum of $100 on any use at all, I was receiving royalty statments that showed $3 sales with just over a $1 net to me. That is worse than the $30 still life of coins guy! How does this photog (and others) keep themselves out of the dreaded $3 photo bucket? It took me two months of complaining before I got out of it, is it possible that Getty has many classes of photographers -- some automatically in or out of that category? Thank heavens none of the usual witless wonders made good photographs of the pitcher working his rare perfect game. If they had, they doubtless would have left all that money in Gatorade's pockets. Gatorade's "media buy" is enormous, and I hope our photographer netted enough to make at least half a year's mortgage payments on *both* the city apartment and the country house. "Take many photos of the pitcher." "Tell no one what I said." 99.9% of all pro shooters will be unable to get access. 99.9% of all pro shooters have access to loose change & mason jar. John... you make an incredible number of assumptions here and report them as fact, without apparently having done any research into their accuracy. Did you bother to contact Ron Vesely about his contractual terms with Getty before writing, or did you just "assume" what you wanted it to be? Most major league sports (NFL, MLB, MLS, NHL, etc.) have exclusive contracts with Getty for their league photographers. If you shoot for a team (most as independent contractors), you are required to work under a Getty contract. Every team has their own contract photographer(s), who provide photos not only for their home team, but for the visiting teams and Getty, too. It's incredibly presumptuous for your to assume that Vesely has contractual terms that he likely does not. As a photojournalist, you know you should check your facts before publishing unfounded statements. At the very least, you should have contacted Ron directly before "reporting" what you *thought* his Getty contractual terms might be. Your continued reporting of half truths and unverified information, without even making an effort to get to the real truth, is appallingly irresponsible. You should be ashamed to call yourself a visual journalist. I find it astounding how the detractors (and they have a right to their opinions as we all do), hide behind the cloak of anonymity without exception. If you truly want your point heard, how about letting us know who you are? I will never do business with Getty or Corbis until they change their operations. Currently they are destroying photographers' ability to make a living. Why on earth would I help them in any way? SI paid no more than any other image for that cover. it was not exclusive. You really show how inept you are as a journalist when you make the post you do. you should stick to making videos of how to pack lightstands in bags and being annointed as an expert in that area. As for Vesely he is the team photographer for the White Sox and a bully and he has made it quite clear on many occasions with news,freelance and magazine photographers at the games actually warning them that "He better not see any images of the game on photo agency sites or they will never be given access to shoot a White Sox game again." It's not exclusivity or negotiating it's scaring the crap out of working photographers so he can have the only images available for sale through Getty. Which by the way how is that not a major conflict of interest that Veseley makes all the decisions on who gets credentials and keeps out those who would be competing for any sales? Despite what they White Sox might say Officially that the Media department makes the decisions, it's Vesely keeping out any other editiorial competing shooters, and those that get approved are warned to not be making available any images to agency's. it's not good negotiating he has his own monopoly over there and it is just waiting for a lawsuit. Dear Anon: SI paid the cover rate to Ves that you so covet. Ves is the team shooter and as such is entitled to all the deference that comes from being a master and the team shooter. Who cares if he is a little bit strong with respect to the order of who gets to shoot from where when, but that comes with the territory. Your comments are way out of place. If they were true, how did US Presswire, which had three images in the SI issue at hand and Jim Prisching, the local AP shooter, publish their images and then show up this past weekend to cover the series with the Yankees? You are just miffed because he called you out for the makebelieve wire service you work on spec just to get creds. How do you define "working?" One who makes all his income from shooting or one who works for one of those makebelieve wire services that get you the desired creds to feed his ego? Your comments besmirch Ves's reputation. If he is so busy keeping out other editorial competing shooters, why is USPW, the Tribune, AP, the STNG and in the past the Southtown shooters at every game? Stick with PrepSportsOnline and Maxpreps where you can be the big fish in the little pond. If you KNOW I got something wrong, then call it out. I know there are no factual errors in this piece. >>>SI paid no more than any other image for that cover. it was not exclusive. Wrong, and wrong. See above response to you as well. Then why don't you quote your real sources (if indeed you actually have any) about details of Ron Vesely's Getty contract - good or bad? Otherwise, your reporting of so-called facts is little more than hearsay or blind assumption, much as if I were to report that John Harrington's photo business this past year has effectively died (based only on assumption: because most other assignment photographers are struggling with dying businesses, so too are you). You're not a journalist, you're a rumor-monger when you refuse to even contact your subjects directly to get facts before "reporting" a story. There is a difference, though. Anybody can take a photo of coins in a jar. Only one guy was able to take the perfect photo of the perfect game. Supply and demand. Otherwise known as: Capitalism. "If you KNOW I got something wrong, then call it out." You did not do that, you just ask me to reveal my sources, which I will not do. I can tell you that my sources are unimpeachable on this.